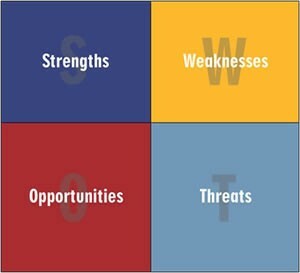 A term that is often used when referring to business planning of any kind is a SWOT analysis. It is the starting point for any type of business plan, whether that plan is for a start up venture or a company that has been running for many years. This article will discuss what a SWOT analysis encompasses and how to utilise it in business planning. What Does S.W.O.T. Stand For? Strengths and weaknesses are factors internal to the business. That is, every business will typically display strengths in certain areas, while it will also have definite weaknesses that are impacting its performance internally. Opportunities and threats are external to the business and are a collection of elements from the environment in which the business is operating that could affect its performance both in the short and long term. Strengths and opportunities are seen as favourable to the business. Alternatively, weaknesses and threats are unfavourable factors. The first step in the SWOT analysis is to analyse the business with an ‘internal’ focus. It is necessary here to consider the business objectively and assess its strengths and weaknesses. It is also important that all areas of the business are considered e.g. sales, marketing, manufacturing, warehouse management, financial management etc. All these areas of the business are interrelated and often a strength or weaknesses in one area can impact one or more other areas. Strengths are those areas of the business that give it an advantage in the marketplace. Often these strengths are what will positively differentiate the business from its competition and can be leveraged to gain a distinct market advantage. Conversely, weaknesses are areas where the business is underperforming and could be impacting its position relative to the competition. By identifying strengths and weaknesses throughout the business it becomes easy to identify areas that can be improved. Obviously any area of weakness can always be improved but often strengths can also be developed further to provide an even greater competitive advantage. After closely examining the business from an internal perspective, it is now time to look at the outside environment to identify any opportunities or threats that will affect the business. Examples of externalenvironmental factors include technology, government, demographics and many more. Essentially these are things over which the business has little control but they could have an impact on the business and/or the marketplace in which it operates. For example, advances in technology are always occurring. If a business is reliant on technology in any way, these changes must be considered and factored into the planning for the business. Once all the factors have been analysed, it is then useful to ‘map’ the strengths and weaknesses to the opportunities and threats. That is, if the business has strengths that can be ‘mapped’ to identified opportunities, then it is possible to plan how the strengths can be utilised to maximise the opportunity. Similarly, if there is an area of weakness that will become more vulnerable because of an identified threat, action can be taken to minimise any impact on the business. Planning at this level provides a great overview for any business and forces it to truly identify its position relative to its competitors and marketplace. Once completed, the SWOT analysis will provide a solid platform to begin the planning and business development process. As with any planning process, it is important that the SWOT analysis is regularly revisited and integrated into the business plan. Kestrel Solutions integrates the SWOT analysis into the planning process it offers clients. To see how it is works click here.